I had a conversation with a friend yesterday. I was talking about how I wanted to blog about an upcoming event, but how I was hesitant to do so because it happens to be taking place where I work, and I am so cautious about the overlap between this blog and my place of employment. They looked at me and said "You write a community blog, right? About life in this community? And you are avoiding writing about the most important place in this community because you work there? You do know that doesn't make sense, right?". No one had really put it so succinctly before, and so I realized that by not writing about these things I am doing a disservice to this blog , and to my readers - and so today I write about an event I have attended many times, but this year I am seeing instead from the inside. I have gone as a guest in previous years, taking with me the Intrepid Junior Blogger. We have always had the most incredible time, because it is an incredible event on many levels. To say it is "fun" is an understatement, and it might well be the busiest day of the year at MacDonald Island Park, when thousands of people visit the facility for a day of festivities and fun - and all for free. The event? The annual New Year's Eve party of the year, The CRAZE. In previous years I have marvelled at the event simply because of the sheer number of people (over 10,000 last year) and at the amazing variety of things happening. It seemed like there was something for everyone, from the live entertainment to the food to crafts and activities. It always seemed like an enormous undertaking, a huge task for the people who deliver the event every year and who do so with the kind support of generous partners and sponsors. I suppose I always understood the amount of time, work and effort that went into the event, but what I hadn't always understood is why they did it, because it is an investment of all those things. And the reality is they do it because this is just what being the heart of the community means. It means throwing an enormous party for thousands of people, children of all ages and parents and young adults and seniors and everyone else who wants to come and celebrate the end of one year and the beginning of the next. There is a full slate of events planned, which you can find here. What you can't find at that link, though, is the feeling you get when you walk through halls packed with families enjoying the day. You can't see the joy and enthusiasm of the people participating in the events. And you can't feel what you feel when you see the fireworks exploding overhead, lighting up the northern sky in incredible colours. New Year's Eve is a special time. It is a moment when we reflect on the past year, and think about the year to come. I know for some it is a night of carousing and drinking, but it never has been for me. It has always been the opportunity to spend time with the IJB and think about how every single year has brought new changes, new challenges, and new possibilities. Perhaps this has been more true than ever in the past two years, when I watched fireworks explode overhead and thought about how far I have come in my life here, and how far I have yet to travel. Tomorrow is the first time I will see an event I have loved from another point of view. I will see it with new eyes, I think, but not with eyes jaded but rather with eyes opened to the wonders of the community in which I am so fortunate to reside. I will wander the halls and wonder at the children and parents. I will see one of the things that has always touched me the most - a community, celebrating together as friends, and as family. I will watch as we bring one year to a close, and prepare to welcome a new one. And this year I have not only the pleasure but the honour of doing it with my coworkers and being part of the team bringing this event to the community. This year I won't just be a guest but I will be part of the event, and I am so absurdly excited about the prospect. I know I will see many of you tomorrow as we celebrate New Year's Eve together. I hope you stop and say hello so I can wish you a Happy New Year - because every new year is like a new baby, full of potential, hopes, and dreams. Tomorrow we will welcome 2014, and I will do it in the place that has always been like a second home to me, a place now closer to my heart than ever. 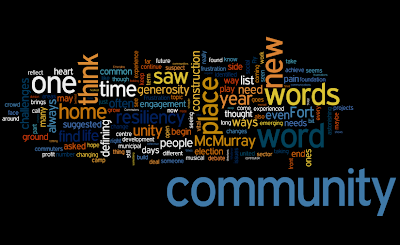 And I will do so surrounded by my community, my coworkers, and my friends - and with an grateful heart I will say good-bye to 2013, and hello to a new year, full of all the things that make my life in Fort McMurray so rich and full. That's all it takes in this world, one tweet retweeted thousands of times, captured in screenshots and sent around the world, and inspiring hashtags like #hasjustinelandedyet that saw tens of thousands of tweets attached (hashtags for the non-Twitter literate are a way to search and group tweets, so having one with over 40,000 tweets is a pretty impressive feat). There was something worrisome about the Twitter pitchfork-and-torch mob that formed after that tweet, and it was an ugly incident in many ways. But the reality is that it did not have to happen at all. I have written about the perils of social media, and recently I watched aghast as a drama played out on my computer screen. Both the Intrepid Junior Blogger and I were amazed, she just as Twitter-literate as I, as we watched a young PR executive's career and life implode after that one tweet posted just prior to boarding a flight to South Africa and turning off her phone. That one tweet has had incredible ramifications, particularly to the woman who sent it, who now appears to have been fired as well as likely seriously jeopardized in terms of ever working in PR again. And it is all about truly understanding the power of social media, both to do good and to do harm. I have been witnessing some disturbing trends on social media recently, and many of them far closer to home than the Justine Sacco tweet. There seems to be some sort of pervasive belief that social media is not only the home of "freedom of speech" but the home of the inalienable right of "freedom of consequences from free speech", which are, incidentally, two very different things. I firmly believe that every person has the right and freedom to express their opinion, just as I do almost daily in this blog and on my social media - but I also believe that with that freedom comes responsibility, and consequences. There is even a local Facebook page with an "everything goes" philosophy, but in recent weeks it has morphed from a page where people bought and sold items to a page where far too often you find overt and covert racism. You find comments and posts that could easily lead to defamation of character lawsuits, and on Christmas Day I was stunned to see people advertising liquor for sale and others defending them with the strategy of "it's just people helping people" (I am sure that the Alberta Gaming and Liquor Commission that regulates licenses for alcohol sales takes a rather dim view of this "helping"). The individuals there truly seem to believe that they can say whatever they want on social media and suffer no consequences, and seem blissfully unaware that employers, police forces, and many others monitor social media. They seem oblivious to those who have been sued for defamation over things said on Facebook and Twitter, and those who have faced investigations for criminal charges based on activities they posted about (eg, the illegal sale of goods). I worry that the page administrators may not realize that precedent law is being set right now, law that could easily deem those who run or administer such pages to be legally responsible for the content on them. And I fear that those who think social media is an "everything goes" medium have miscalculated gravely - because social media means every person who uses it is under the microscope more than ever, and one badly thought out tweet or post can have consequences stretching far beyond what the same thing said in a casual discussion between friends could ever have. The reality is that every single thing said on social media can be accessed by a wide audience, particularly on Twitter. It is as if everything said there is being said on a stage with millions of potential audience members. 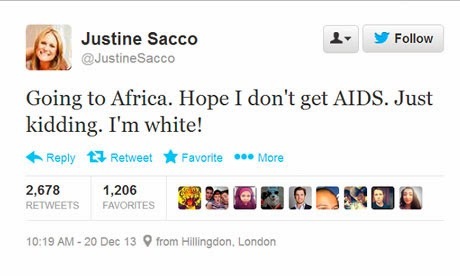 Perhaps you think it will only be noticed by a few, or none at all, and perhaps you have said many such things in the past and never had a problem (Justine Sacco had a history of questionable tweets, and I am sure she never thought this most recent one would be the one that killed her career). The reality is though that one tweet or post can move like wildfire, around the world in minutes, and lead to a cascade effect you could likely never predict. Things that you perhaps once would have said to friends over coffee can instead be posted and read moments later in a country across the world. 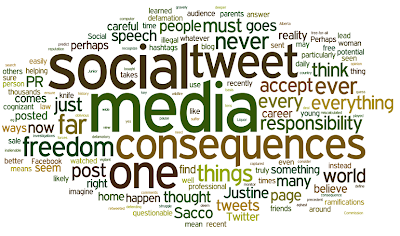 The things you say have consequences - and far from there being no consequences to social media perhaps the consequences are far greater than ever. The free and easy speech you find there does not mean freedom from responsibility and consequence - it means that you must be more vigilant than ever before about what you say, because it can define you in ways you will never imagine. What we need to acknowledge is that our social media use comes with responsibility, and we must accept it. If we are going to tweet or post things that are defamatory, racist, illegal, or otherwise questionable we must be cognizant that there may well be unintended consequences, and instead of crying "freedom of speech" we must recognize that every freedom comes with responsibility. And most of all we must ensure our youth understand this, although at times I think they are far better equipped to deal with this than their parents, growing up as digital natives while their parents struggle to keep up. Perhaps Justine Sacco, who as a PR professional should have known better, thought that "everything goes" on social media. What she learned is that a few words, less than 140 characters in length, can mean that everything that "goes" is your job, your career, your reputation, and your name, now synonymous with one of the greatest examples of how social media can destroy you. That one tweet should be seen as a cautionary tale for all of us, because while we are so certain it would never happen to us I would venture to guess the young woman in question never thought it would happen to her, either. I use social media on a daily basis. 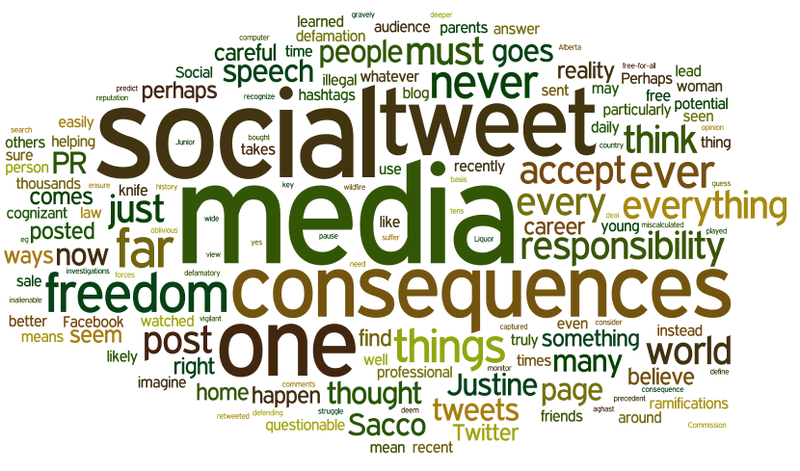 I am careful with what I say and do in my online presence, but even more than careful I am cognizant of the potential for consequences, and I consider it before I post or tweet or blog. I think about the possible ramifications, and then I decide if I am willing to accept them or not. And then I press the post or tweet button, acknowledging that doing so is fundamentally a contract in which I accept that whatever happens from that point on is something I have chosen. It is something I have learned over time, because I too have seen consequences for things I have said on social media, and I have had to accept my own responsibility. And now every time I hit the "enter" key I pause, and think: "Do I accept all consequences?" - and if the answer is yes I push down. If the answer is no I walk away - just as I imagine one PR professional wishes she had done. Social media is not a free-for-all - far from it. Social media is one of the most powerful tools we have - and it is knife that cuts both ways, sharply and deeply and with a tendency to swing back and cut us deeper than we ever would have predicted. Justine Sacco and the tweet heard 'round the world is a reminder to be very, very careful about how you wield that knife. This was a different Christmas for me. Oh, I know every Christmas is different, but some years bring with them such tremendous change that it impacts every facet of your life, including how you spend your holidays. 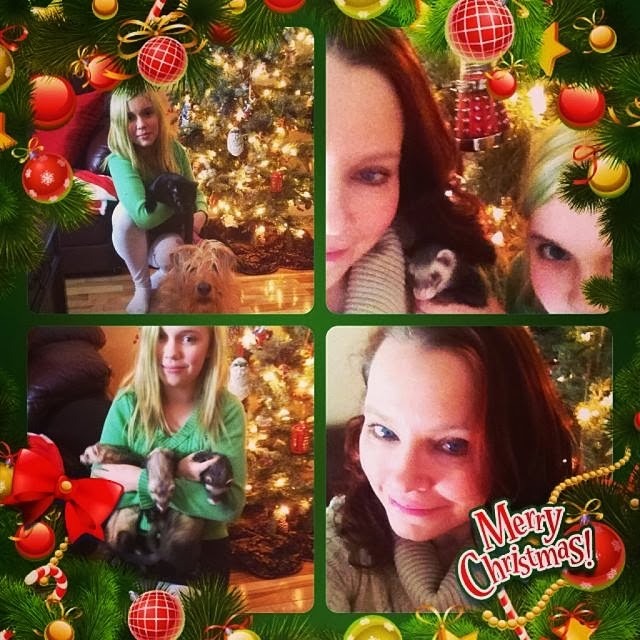 I was not alone this year in facing a very different Christmas, as I knew several others going through the same thing. For some it was different because they were new in our community, and for some the difference was the tragic loss of a family member, altering their holidays - and their lives - forever. With these changes and losses often comes another loss, the loss of the traditions we hold dear. It can be so hard to lose them, and this year I struggled with it - but I forgot that losing traditions comes with a silver lining. It comes with the opportunity to make new ones. Growing up I recall so many Christmas Eves spent at the long table my father built, designed to hold a large and growing family. My mom would cook and bake and my dad would pull out his accordion, and late into the night we would sing carols, off-key and out of tune and not caring in the least. At midnight we would all go to midnight mass, and when we returned we would open gifts, no Santa Claus needed in my house where the gifts came instead from each other (yes, I grew up never believing in Santa, and have never felt cheated about it, either). My parents would sing Silent Night in German, and we would go to bed at about 3 or 4 am, crawling out in the morning when we could smell the bacon frying and knowing round two of the Christmas celebration was about to begin. My parents have now been gone for many, many years. There is no accordion at Christmas Eve, and I have not attended Midnight Mass in a very, very long time. Once, in a hotel a few years ago, some wandering singers sang Silent Night for me in German, making me weep so hard that they worried they had upset me, not understanding that they had evoked memories that went back into the depths of my childhood. Those traditions, though, quietly passed away as my parents did, and slowly I forged new ones with my family. And this year the Intrepid Junior Blogger and I found ourselves settled into a new life, and we discovered the opportunity to create some new traditions. This year she and I began cooking and baking together, something I never thought we would enjoy but something destined to become tradition for us. Now, she does get a bit Gordon Ramsay-esque in the kitchen, with a lot of "Stir this! ", and "Chop that! ", and "For the love of god Mom, get off Twitter and check the pasta! 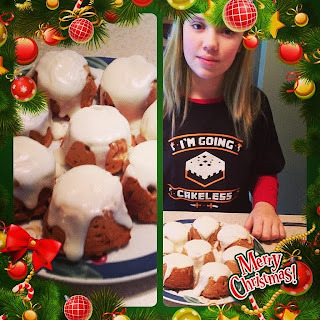 ", but we created more food and laughter together than we have ever done in the past, from cookies before the big day to Greek pasta salad for Christmas Eve to sweet rolls on Christmas morning. It was the beginning of a new tradition, and suddenly I stopped wishing for the old traditions - because just as people leave our lives so do some of our traditions, making room for new ones that embrace our changes. We have so many traditions now, you see, and they are changing and growing just as she does. This year she "Stuffed the Bus" at the Santa Claus parade, and I think this will be something she will want to take part in every year, her passion for the food bank and the work they do so strong. I attended many Christmas functions and events, but perhaps the most satisfying moments for me were the simplest ones, ones where I got to see her beginning to explore traditions of her own. We ended our Christmas Eve watching a movie. 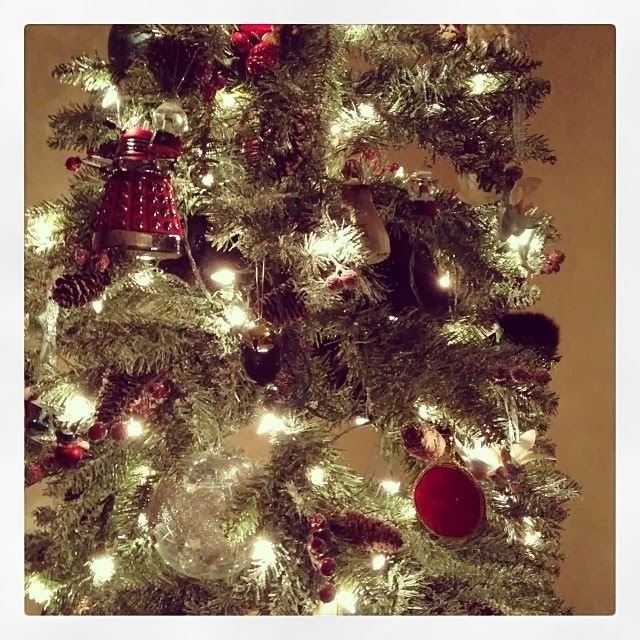 I suggested the Christmas standards, but she looked at me and said "New tradition - Monty Python?" - and so we ended the evening with Monty Python and the Holy Grail, a movie we know well, reciting the lines and singing the songs and laughing. We ate homemade pumpkin cheesecake and she asked me to teach her to make it so some day it can become one of her traditions, too. 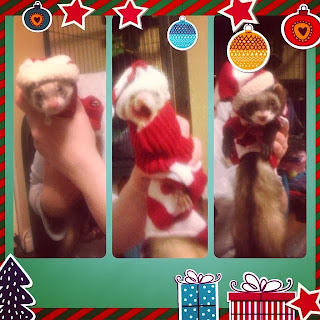 And we spent Christmas morning eating sweet rolls, watching the dog devour a rather large treat, the cat get high on a new catnip mouse, and trying to stuff three small ferrets into three even smaller sweaters and hats. Our traditions have changed. Our lives have changed. I think it is something to not only accept but celebrate, because part of life is change, and how we deal with it. Some changes, like the loss of my parents, left a loss of tradition that is hard to accept but that has become an immutable part of my past, echoes of a time gone by that can never be recaptured but that will never be forgotten. Some day the IJB will move on in her life, and with those changes she will find the need to forge new traditions, and to cope with changes. If I am proud of anything it is perhaps that this year I showed her how it can be done. Perhaps you forged new traditions this year, too. Or maybe you carried on the ones you have had for years. It doesn't really matter in the end. In the end what matters most is simply knowing that traditions, like lives, change and grow, and that this isn't a bad thing. It is, in the end, just like life - and life is all about forging the new while never forgetting the past. Saturday evening, and almost 6 pm. I dread it - can't stand the idea - but know I must do it because a dead battery had delayed it earlier in the day. My mission: to get into and out of Wal-Mart as quickly as possible, with some fuzzy socks for a stocking stuffer and my fragile Christmas spirit intact. I was not optimistic. I was fairly certain I would find the stocking stuffer, but the Christmas spirit, a fragile flame for me this year, was in serious danger of being snuffed out by facing crowds and surly tempers as the days grew closer to Christmas. But I forged on, and drove to Wal-Mart, feeling trepidation in my heart. I was surprised to arrive and quickly find a parking spot, and even relatively close to the main entrance, a happy circumstance in such cold temperatures. I walked inside and found it busy, but just regular busy and not "super chaos prior to Christmas countdown" busy. I went in search of the fuzzy socks and while those proved elusive I found several other small items, and faced my next nemesis - the till. But even there I was finished rapidly, purchases stuffed into my bag. And as I left the greeter wished me a Merry Christmas, a nice touch to a so-far pleasant experience. I was quite stunned to breeze through so easily, and since it had been so entirely pleasant I headed next to Staples, where I found several more small things I had been looking for. Another quick trip through the till with a lovely cashier imbued with holiday spirit and on I went over to the mall, pumped up by my incredibly trouble-free shopping experience. Quickly I whipped through three stores in the mall, finding fuzzy socks and other small items to fill a certain stocking. I was leaving one store when I heard a voice, tinged with that lovely Newfoundland lilt. It was coming from an older lady, it seemed, and it said, "I knows you!". I stopped, suddenly filled with a bit of dread. Which story had she read that she objected to, I wondered. Which post or column had angered her, I pondered. And then she said, "You write the stories! Now, my man loves your stories, you know." She drew close to me, close enough that I could now see her face held only a smile and no ill intent. "You know, my man, he doesn't cry. Well, he cried once when his nan died, but he never cries. But you wrote a story that made him cry once and ever since he reads your stories, and now I reads them too," she said. "I recognize you from when you were on TV months ago." And then she said the words that melted my heart. "Thank you," she said. 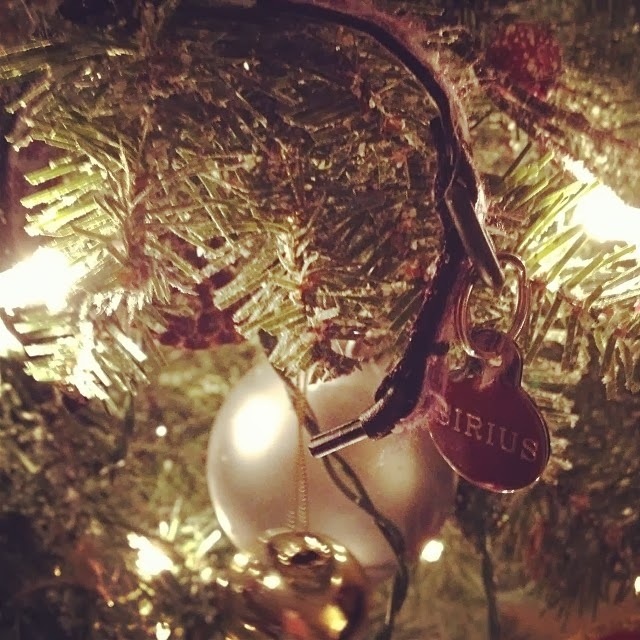 "And God bless you and your little girl, and you have a merry Christmas now!" - and then, out of the blue, this total stranger hugged me and disappeared into the crowd. I hadn't really said a word, unable to respond quickly enough to her sudden onslaught of kindness and cheer. I stood there in the mall, my hands filled with shopping bags, and with tears in my eyes. That elusive spirit, the fragile flame that has been burning in my heart for days, was suddenly given new fuel, and burned brighter and stronger than ever. I never thought that what I do here in this blog would ever impact anyone, you see. I never believed it would have any relevance in any life other than my own, and I am always humbled when someone says they have been touched by what I do. But in the end the life most impacted, and most touched, has been my own, because this blog has brought people into my life who fuel and strengthen the fragile flame of my spirit, and who remind me that there are so very many good people in this community. I wandered out to my car, in a bit of a daze. And then I drove home, my eyes misty with tears and gratitude to a total stranger who helped me find my Christmas spirit, and renewed my belief in what I do, and why, and all those who live in this place we call home. To her, and her man, I say Merry Christmas - and thank you, to them both and to all of you, not just for taking the time to read this blog but for taking the time to give to this community and to each other. Thank you for making this the easiest place in the world to write about, and the place where I always, always, find my Christmas spirit - because it so very abundant here, in this little place surrounded by the boreal forest and under the dancing northern lights. and now it is one of mine, too! I stare at it in disbelief. My reliable little car, always so quick to start, sat there like a dead and frozen lump. My plans for the day ruined as instead of an early start at the stores I now faced trying to find someone to boost a very frozen battery, after the umbilical cord connecting my little car to the electricity it needs to warm the battery had somehow come disconnected. It was -37 degrees Celsius according to my iPhone app, closer to -50 with the windchill. I was disappointed in how my day was going south - but more than that I was very worried about something else, something more important than a delayed trip to the grocery store. I was worried about those in our community who sleep rough - outdoors at night in -50. It is the kind of cold that gets into your bones, and as I get older I find I have a harder and harder time adapting to it. It makes me ache and just a short time outside leaves me trying to warm up for hours, and I think some of that comes with age as the Intrepid Junior Blogger does not seem to have this issue. And that worries even more, because many of our homeless population are my age, or even older. They face these temperatures daily, even sleeping outdoors in them, and I cannot imagine the havoc it wreaks on their bodies. Added to the cold is that often they have the illnesses that plague us as we age, too. Arthritis, diabetes, weakened eyesight, liver or kidney issues - how does one manage those when one lives on the street, exactly? And how does the extreme cold affect those diseases, and those who suffer from them? It makes my heart ache. Every night I go home to a cozy little house and put on fluffy pyjamas and cuddle up with the kid and the cat and the dog. Every night I go to sleep in a warm bed, safe not only from harm from those with ill intent but safe from temperatures that freeze cars and skin solid. And every night I struggle with knowing that there are some who sleep outdoors in this, seeking whatever sliver of refuge they can. Someone posted on Twitter recently about feeling unsafe because homeless people were asleep inside a local ATM lobby. And while I empathize with their fears I have spent a couple of nights pretending to be homeless, and I know that I would sleep in apartment lobbies and staircases and ATM lobbies without a hint of guilt or shame because it is better than freezing to death outdoors. And this is the sad reality. Homeless people freeze to death during this time of year, their fragile bodies finally succumbing to the cold and the diseases they suffer. This tragic end is something I can barely tolerate thinking about, because no one should die because they were literally left out in the cold. We have made some terrific strides in addressing homelessness, and we have housed many who are now spending their nights indoors and out of the bitter cold. But it is still estimated that over 50 people sleep rough in our community every night - including nights when it is so cold that it is beyond imagination. I have met them, you see. I have talked to the individuals who sleep rough, the ones who have lived in tents on the Snye for years (some over a decade) and who continue to face extreme cold and all the other hazards of homelessness. I worry about them all, but I worry most about those who are beginning to age, and who I fear will become a sad statistic. I worry most about the ones who I can see aging before my eyes, growing rapidly older as the days and nights take their toll on them, body and soul. I do what I can. I have been known to quietly drive downtown and cover a sleeping form with a spare blanket. I have dropped off hot drinks. I have given away warm boots and coats, and mittens and toques. I always feel totally inadequate in my response, though, because every night I know that over fifty people go to sleep on our streets. And I know that every single night brings some of them even closer to being one of those who has died there. This year the Centre of Hope is doing their Sub-Zero Challenge again, this time in an attempt to raise $30,000. This seems like such a modest number given our incredible philanthropy, but this small amount will help to provide warm clothing for the homeless in our community. It might not solve the problem, but it might help them to continue to battle the cold, and survive another winter. I don't claim to know the solution to homelessness - because it is not a simple problem, and therefore there is no simple solution. All I know is that yesterday when I sat staring at a dead and frozen car my thoughts went immediately to the people in our community who huddle in small lumps at night, trying to stay warm. I thought about times I have seen people walk by them as they lay in the snow, and the times when I have seen someone stop to check if they were ok. And I thought of a time in Toronto when I walked down a street in my neighbourhood and saw a small lump covered by a sheet and surrounded by police officers, waiting for an ambulance to come and take the body away, one of the homeless people I had known and who had apparently succumbed to a heart attack one cold night. I know that as one person I may be able to do little, but that as a group of people we can do a great deal, including donating to the SubZero Challenge and giving our warm clothing to those in need. I may not know much but I know one thing for certain. I know we cannot do nothing, because if we do nothing then we are responsible for the suffering of those in our community who have nothing when many of us have so much. I don't know about anyone else, but that is a cross I cannot bear, and so I will do whatever I can and whenever I can to lessen their burden - and mine. I cannot simply walk by those in need, physically or mentally. And anyone who can may well be frozen, too - just in their heart. Last night someone asked me what I want for Christmas. It was a question I actually dread, as I am not good at asking for things. In fact I am almost incapable of asking for presents, opinions, or assistance as I am the product of two parents who rarely asked for anything and raised five daughters who have followed in this habit. Asking for things is just not in my nature, and so last night I thought but could not come up with a single thing I want - but I came up with lots of things I already have. And that is where it really got interesting. I thought about all the things I have, and I thought about all the things I am so grateful for - and then I realized that while I want very little I have so very much to be thankful for, and I rarely take the time to express those thanks. So, this is what I want for Christmas, I guess - an opportunity to thank some people for the things they have given to me. Since I have this handy little avenue of self-expression I hope you will indulge me. 1. Thank you to the staff of Starbucks at the Thickwood and Downtown Safeways, and the stand-alone on Franklin Avenue. You see me virtually every single day, and you keep me fuelled with the nectar I need to keep moving. And thank you too to the staff at the new David's Tea in the mall, because you keep me supplied in the teas I use at night to wind down after my caffeine-fuelled adventures. 2. Thank you to my hairstylist Ellen of Technicuts, Mucharata of Frost Jewelry, and Helen of Helen Arong Fine Fashion - you guys let me explore my love of fashion and keep me looking presentable for both work and play. And besides all that all three of you are incredibly inspirational women following your own dreams of entrepreneurial success and following your passion, and your drive fuels my own to follow my own dreams, too. 3. Thank you to the Alberta government for the interchange completion ahead of schedule. This is an early gift I cannot ignore, because it has made my life so much easier. I work at MacDonald Island and live in Thickwood, and I recall heading home the first evening after the new ramp at the end of Franklin opened. I turned right and travelled up it in almost complete disbelief, my mind singing "free at last, free at last, I thank God I am free at last" as I made it home in eight minutes. Eight. Minutes. You have given me some precious time back in my life, and I am so very grateful. 4. Thank you to the people who let me write for them. Krista Balsom of Your McMurray Magazine, Andryia Browne of Connect Weekly, and the folks at Northword have given me the opportunity to say what I want to say and to explore the stories close to my heart, and I am so very grateful, because when you are a writer you have words you need to get out, and I am incredibly thankful to have places I can do it. 5. Thank you to all the social profit organizations who let me work with them in any capacity. Maybe they were under the illusion I was helping them in some way, but they are entirely wrong as they were most definitely helping me to grow and develop as a person and a writer. Thank you too for all they have done for the Intrepid Junior Blogger, as so many have invited her to learn more about them as well, and I am so grateful that they have give her the opportunity to discover what philanthropy and volunteerism truly means. 6. Thank you to the people who got me into my new house this year, where I will spend Christmas with the Intrepid Junior Blogger and what we now refer to as the Intrepid Circus and Zoo Menagerie. My realtor, Cassandra Slade, also happens to be one of my best friends, and when I needed to find a home, not just a house, she helped me to find it, patiently wading through a lot of not-its to find "it". And then Men In Black got me moved, even moving a ridiculously heavy upright grand piano without a word of complaint, and only occasionally asking how many boxes of shoes I had exactly. 7. Thank you to the people I work with. It is hard for me to actually explain what it is like to work at MacDonald Island Park, because it is far more than I ever imagined. What has happened is that since February I have become part of a team, but not just any team. I have become part of a team that inspires each other to be better every day, that supports each other, and that works together to bring amazing things to this region. I would say I am "proud" but that is ridiculously inadequate. I'm actually just damn excited and thrilled to come to work every day. 8. Thank you to those little local businesses that not only provide me with goods and services but that make me smile with their passion, vision, and drive. From the ladies at Bearstone Bakehouse and their baking that has allowed me to host an incredible house warming party and give my co-workers great holiday treats to Clearwater Coffee in Habitual Sports (where Chris makes the best latte in town) to Mitchell's for keeping me supplied in salads and soups these little businesses do what they do without a franchise or chain behind them, and they have not only my support and loyalty but my admiration, too. 9. Thank you to the people I argue with on Twitter. No, seriously, thank you. And not just the ones I argue with but the ones I banter with or just chat with, because those dialogues help me to grow (even the arguments). 10. Thank you. For reading this blog, or liking my Facebook page, or following me on Twitter, or sending me an email (and patiently waiting for a response, as this full-time job, single-parent, Intrepid Circus and Zoo ringmaster life of mine means I am just not as quick to respond as I used to be). Thank you for sending me kind words, and for stopping me on the street to tell me you enjoyed something I have written. Thank you for contacting me on Facebook - and I will even thank you for sending me hate mail, because at least it means you are paying attention (and I read every single word of that hate mail to see if somewhere in it is a nugget of truth that I need to consider, too). So, what do I want for Christmas? I suppose I want to sleep in, and wear pyjamas, and watch TV with the IJB, and cuddle the cat and the dog and play with the ferrets and eat some cookies and drink lots of coffee with Baileys. But otherwise I don't actually "want" a damn thing - because I already have so much, more than Santa Claus could ever fit in a sack. All I want for Christmas is right here, in my life in Fort McMurray - and so I say thank you! with a young Judy Garland. Recently I met someone I have never met before. And when they saw me they didn't comment on my blogs about politics, or the columns I have written about Highway 63. They didn't mention some of my epic moments on Twitter (epic perhaps only in my own mind in retrospect) or the interviews I have done. No. They said "oh hey, you're the one with that black cat, the famous one from the SPCA! Sirius Black, right?" Yes, people, it's official. I am now a well known crazy cat lady with perhaps the most well-known cat in town, having his own Twitter account, several blog posts, and some newspaper columns devoted to his transition from life as a stray tomcat to life as a neutered king of the house. And it seems that little black cat of ours has captured some hearts other than our own, too. I would love to say that Sir Black, as we call him, is a good cat - but he is not. He is the baddest of the bad, the cat who climbs the drapes at 3 am and then meows to be rescued on learning he is stuck. He is the cat who teases the dog mercilessly, the poor dog quite in love with this plush black creature who eats her food, steals her bed, and plays with her toys. He is the cat who pounces on the ferrets, leaving us scrambling to rescue small creatures of which we can see only frantically scrabbling paws. 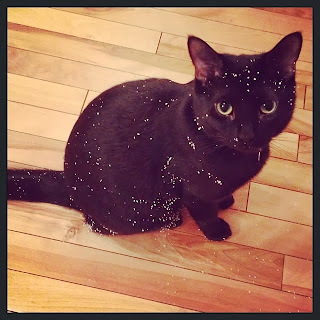 He is the cat who climbs the Christmas tree again and again, emerging covered in artificial snow. He is the cat who is still determined to escape outdoors and likes to make a mad plunge for freedom when our hands are full. 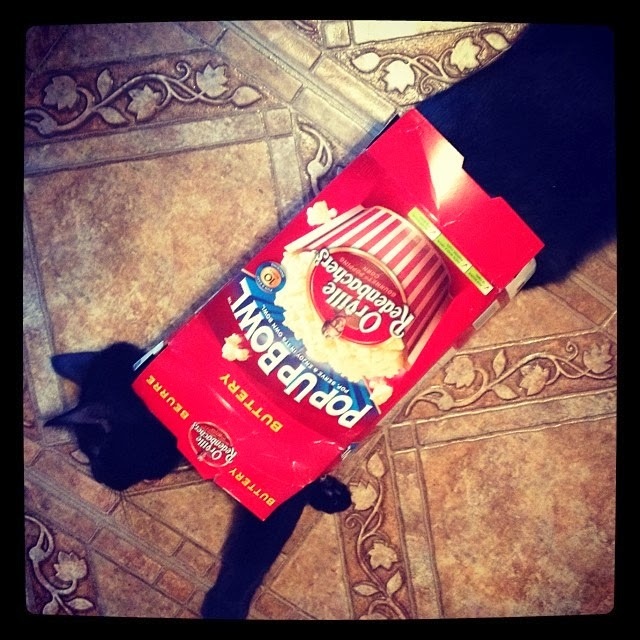 He is the cat who rips open bags of food - dog, cat, ferret, and human - just to see if he likes what is inside. He is the cat who jumps inside every box and bag, empty or filled, and resists being removed. He is the cat who is attempting to quietly remove every ornament from the tree, including several glass balls he shattered chasing them down the stairs (before I smartened up and took off the balls, so now he has moved on to the other ornaments instead). He is the cat who is always hungry, always staring at you, and sees us quite clearly as the people he needs to open the cat food cans. In retrospect he might be great at being a cat, but he is a terrible room mate. Totally was not in the tree. Totally did not get stuck in a box. And yet how we love him. from the dog to the ferrets to the Intrepid Junior Blogger and I. The way he purrs when we come home (or when we pull out the treat bag and crinkle it). The way he purrs when he sees the dog, who has become his buddy and with whom he will play for hours. The way the ferrets will jump on him, eliciting that pouncing response of his, and yet they do it again and again. The way he curls up with the IJB at night, just a small black furry lump among all the blankets. The way he makes us laugh, even when we find shattered ornaments, shredded food bags, and boxes with teeth and claw marks. And the way he is always there, a small black shadow in our lives, who might not be a big fan of cuddling but who tolerates us and our need for occasionally clutching a small plush cat. 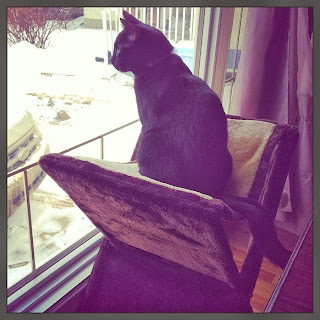 Sirius might have become "Fort McMurray Famous" as we call it, but for us he is that little black cat we brought home from the SPCA a few months ago. He is truly most famous in our hearts, I think. The IJB has always wanted a cat, and while I grew up with them I had forgotten about them and the way they think. I had somehow assumed he would be much like the dog (so laughable in hindsight), easy going and perhaps a bit neurotic. But Sirius has a fully rounded little personality, with moods and attitude, and he has us wrapped around his small black paw - because we forgive his transgressions every single time, and instead of getting upset over broken items we check his paws for injury. We buy him treats and toys, and we are anxiously awaiting delivery of an enormous cat tree that will likely dominate the living room but that we hope to have in time for him to find on Christmas morning when Santa Cat has come (oh man, we truly have lost ourselves in this cat). This Christmas will be a different one for the IJB and I. Just she and I together are forging new traditions, and coming up with our own plans for our celebrations. We expect it to be a quiet few days, with lots of hot chocolate and pyjamas and time just watching TV. 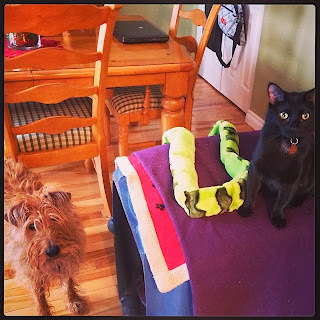 And with us will be our menagerie, three ferrets, one dog, and one small black cat who has completed our family, and found a way to turn us all into cat fans, even an initially skeptical dog. As I write this he lies beside me, in his nightly post-canned food coma, quietly grooming his paws and purring. And all I can think is how much richer our lives are because of him, and how I never expected that a small black stray cat could so quickly become part of the family - and even a little bit famous too. This is a little video of Sir Black. I suspect you will soon see how, and why, he became family. Recently I shared on Twitter some frustration with a local politician who referred to Highway 63 as "very dangerous" in a mass mailer that went to thousands of homes. I questioned the wisdom of this strategy, and it started up some interesting dialogues with those who responded. Some defended the act of calling the highway "very dangerous", and while I tried to explain it is tough to do in a 140-character tweet - and since I have another avenue to express myself I decided to tackle it here. Some months ago someone said something troubling to me. "Theresa," they said, "we have been very good at getting the word out on the issues on Highway 63. Maybe too good." They went on to explain that a large event they were involved in planning wanted to host some guests, but that some of the participants were rejecting the idea of attending - because it would require them to drive Highway 63, and they were too frightened by the press coverage of the highway to do so. What it all meant was that an opportunity for us to create new ambassadors, to welcome some fellow Canadians, to showcase our community, to have people learn the true story of our region and to generate some revenue from the money they would spend in hotels and at restaurants, was in jeopardy. And I had received some emails and comments, too, telling me that community members had found that family members from other places would refuse to come and visit - because they were too afraid to drive the highway. And it got me thinking. Incidentally I consider myself guilty in helping to create this scenario. While I have never referred to Highway 63 as the "Highway of Death" and consider that an absurd nickname I have used emotional writing to convey my feelings on it. I have written repeatedly about the topic, and I have decried our lack of good judgement when we travel it in wanton ways that pose a risk to ourselves and others. What I had never fully realized, though, was the impact this was having on others who now saw the highway as deadly. The reality is many of us have travelled that highway for decades, and while we need to treat it with respect just as we do with every highway, if we drive safely and follow the rules of the road, remain alert and cognizant of our surroundings, we will most likely arrive safely at our destination. If we speed or drive drunk or drive tired then we increase the danger to ourselves and those around us, but sadly that is true on every highway, and every road. This isn't about withholding information, as some of my Twitter respondents suggested, or ignoring the realities, because all highways come with risks and dangers if they are used unsafely. The highway is undergoing the process of twinning, and while 2016 seems a long way away steady progress is being seen on a monthly basis and highway safety improves with each kilometre twinned. We continue to need to address our own driving and practicing safe habits, but this is not unlike every other highway in every other part of this country. The other reality is this: we need to be careful about characterizing the highway as dangerous. We are in a situation where we are trying to encourage tourism and new industrial and retail opportunities. We are trying to attract new residents and encourage people to make their homes here. But if we have leaders suggesting that our highway, which we rely on as the only road access to our region, is very dangerous then it can prove detrimental to those goals. We need to work on those issues, improve safety, increase patrols, and finish the twinning - but we need to also ensure that we are not using hyperbole or exaggeration when we are describing it because we do not want to generate or create fear. Fear doesn't help us make the road safer and it doesn't help us achieve our goals to bring new opportunities and residents to this community. All fear does is make people afraid. I believe we have been extremely effective in what we have done with Highway 63. We have secured a commitment to twin the highway by the fall of 2016, and we have seen increased police presence. And while we still have collisions and issues we are doing something we have never really done before - facing them, acknowledging them, and dealing with them. But in the same way we acknowledge that we have other issues in this community, like homelessness, substance abuse, and other issues (just as every community does), we can acknowledge the issues without creating fear that in the end may prove detrimental to us and our development as a community. So that's why I objected to calling Highway 63 "very dangerous", and why I have taken the opportunity in this blog to expand on it. I recognize some will still disagree with my stance, and I am quite okay with that, too, as we all have differing opinions which deserve respect. My perspective is we that we need to find some balance, and not generate unnecessary fear while still making the changes we need to improve safety, and not just on Highway 63 but on every highway we travel. And while I will continue to write about safety on the highway and advocate for safer driving habits and do everything I can to make it a safer highway I will also encourage people from all over the country to come and see us, even if it means travelling Highway 63 so they can experience the beauty of the boreal forest, and feel the rhythm of the north as that ribbon of road unfolds underneath them. Referring to the highway as "very dangerous" is a double-edged sword - one that can cut through the red tape to get it twinned, but one that can cut us as a community as well. 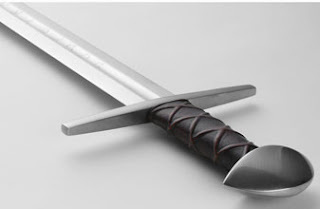 It is a sword we need to wield very carefully, lest we are the ones most harmed by the blade. This will be a very short post. Today I sent an email to my boss to let him know I plan to be out of the office Friday afternoon. I won't be out to go shopping for gifts, or baking cookies. I won't be settling in with eggnog and rum. I will be finding Christmas. This Friday afternoon the Centre of Hope, that humble little building on Franklin Avenue, hosts their annual Christmas party for the patrons. Our local homeless and near-homeless will gather together for an afternoon, and I have been invited to join them, simply to bring them my best wishes. And maybe to some a homeless drop-in program isn't where they find their Christmas spirit - but every year the patrons there remind of the true meaning of the season, and they help me find my joy, and hope, again. And then when I am done there I will head over to Father Mercredi High School, where my buddy Matt and I will join the gang from Santas Anonymous and deliver some Christmas hampers. We did this together last year, not only having fun while doing it but helping an initiative that is one of my very favourites in this city, and one that moves me to tears every single year when I think about how a group of high school students is quietly not just changing people's Christmas, but their lives. Christmas joy and hope is not found in boxes and bows. It is not in wrapping paper, or gifts, or turkeys. 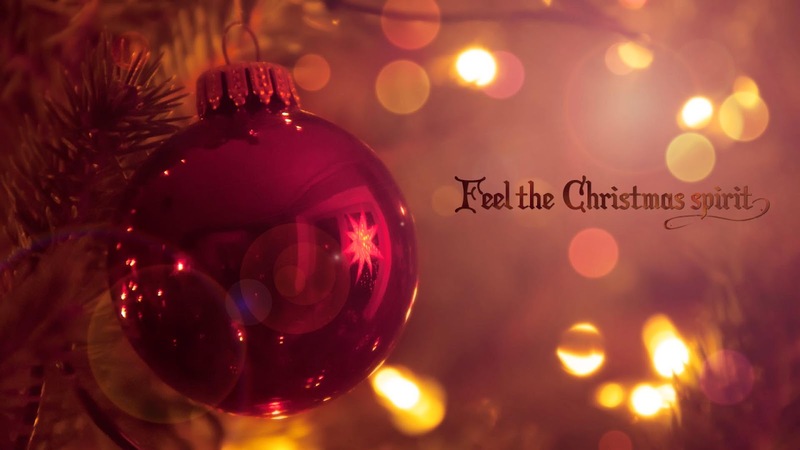 Christmas joy is found in giving of yourself to others, and in sharing with others your hope and spirit. It is in the quiet shared coffee with a homeless friend, or the smile from someone who didn't even know that you were coming to deliver an entire festive celebration to them. Every year I watch several Christmas themed movies and television specials. And every year this is one of my favourites, the ending reminding me that maybe Christmas means a little bit more. And every year as my eyes fill with tears and my heart swells I think about how sometimes finding Christmas means just losing yourself in others, and helping them to find theirs. I love getting emails and comments from my readers. On occasion, though, I get emails and comments that trouble me deeply. I opened my blog this morning and found one of these comments, left anonymously but not one of the anonymous attacks I have come to expect. Instead it was a message that they asked me to read as they have been reading my posts here and my column in Connect Weekly, and they wanted to share their thoughts on a topic I have touched on in both places. The topic? Racism. My anonymous commenter wanted to make it clear that they do not believe the vast majority in our community are racist, but they do seem to feel that many have lack of understanding of other cultures - and they made it very clear that some assumptions are being made based on appearances of those around us, and they shared some of those with me today. How would it feel, they asked, to be asked if the recent taxi cab woes would affect you, and realize you were only being asked this question because the questioner assumed you drove a taxi because of the colour of your skin? And how would it feel to know that in fact you work as a professional with an oil sands company but your race makes people seem to think your only skill must be driving a taxi? And how would it feel to know that in fact many like you, with similar skills and training in your home country, ARE driving taxis here to survive, trying desperately to get the upgrading needed to transfer their skills to this new country? How would it feel, they asked, to have your wife stand up in a community meeting to express an opinion and later overhear someone say that "immigrants should be quiet until they understand the Canadian way", knowing that your wife, who struggles a bit with English, is fluent in French because she was born and raised in Montreal, and is an educated professional who has chosen to stay home to raise children, and who wears the hijab by choice? And that her family has been in Canada for decades? How would it feel, they asked, to know that your oldest child has been called abusive names, ones you won't even put into writing because they are so repugnant? Or that your child was told they should "go back to where they are from", knowing that "where they are from" is Fort McMurray, born in the hospital here, and that this is the only home they have ever known? How would it feel, they asked, to be told you hadn't lived here long enough to hold an opinion, an assumption someone has made not realizing you have been here for over a decade, and proudly declare this your home? And how would it feel to know that while you bring with you years of experience in another country and community, including knowing oppression, poverty, and political strife, that your experience is considered by some to be worthless in any dialogues that may occur in your present community? These questions stopped me in my tracks, you see. I don't know how it would feel to encounter any of these things, as I have never had to deal with them - but there are those in our community who do. My anonymous commented suggested we have a long, long way to go in achieving true multiculturalism and diversity here. They said it is one thing to be a place where there are people of many colours and religions and colours, but another thing entirely where that is not even a topic of discussion and we are all, quite simply, people. I share these comments with you today with sadness and regret, because it has confirmed something I have suspected for a long time. We have a long way to go here. I have seen signs of it, glimmerings of racism on social media, and occasionally outright and overt statements of racism that stunned me. I have seen a lack of understanding, and a rush to blame those of other cultures for societal woes and issues, looking at them when perhaps we need to understand we all contribute to both the good, and the bad, in this community. I have seen the face of racism, but never so starkly as I did this morning when someone took the time to send me their thoughts, their experience - and share their pain. I am grateful they did so, and I present their thoughts to you here today, because this conversation has clearly just begun. Sometimes the conversations that are most painful to have are the ones we most need to hold, and I believe this might just be at the very top of the must-discuss list in our community. Perhaps sharing their words with you might spark you to hold this conversation with others - or with yourself if need be. I know that I hold these words in my heart today, and they tumble around in my head as I try to imagine how it would feel. I do love a good invitation, you know. And so I was delighted when my beautiful friend Mucharata invited me to the launch of her new adventure with the company she has been running for some time now, Frost. Mucharata is pretty much a hero in my books. When I am approached by external media looking to interview someone here who has an amazing story I inevitably send them her way, because she is a pure example of what passion, vision, and drive can become if you employ them to take the opportunities that come your way. 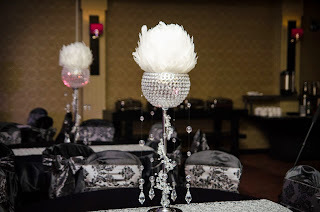 She is one of those who came to Fort McMurray from far away, and she has not only found a life here but founded an amazing business, one that is her passion - Frost Jewelry. It was a pleasure to be at the beautifully decorated event at the Quality Inn, and I could see Mucharata in every touch of the décor, dazzling and sparkling, just like her personality. And the catwalk show of jewelry was exactly what I expected it to be, a showcase of lovely models wearing bold and beautiful jewelry designs, fit for the high fashion runways in other countries and the glossy high-end magazines. And that is perhaps exactly it. Just as Mucharata is bold and innovative, so is her jewelry line. It is not for the faint of heart or timid, and whenever I wear a Frost piece people know it is from her as they make a fundamental statement. These pieces are eminently wearable, but they declare the person beneath them has a love of fine fashion, and an appreciation for the unusual. I have long thought that her pieces belonged to be on the fashion circuit in Paris or Milan, because they are so very bold and creative, mixing up the soft and feminine with the hard edge of haute-couture. They are the kind of pieces that stop others and make them ask where you got it (as often happens when I wear one of her designs), and they are the kind that attract attention. Frost has some understated pieces too, ones that are a little less bold and glittery, but it is the "in your face" ones that I adore, the ones that grab you and won't let you go. These are the pieces that I find myself running my hands over, and working outfits around. A simple black dress, a simple pair of heels, and knock 'em dead piece by Frost is a motto one could easily live by. But as beautiful as the pieces from Frost are the true beauty lies in the company founder, a woman who pours herself into everything she does. She is genuinely kind and compassionate, and she is genuinely a jewel herself, of the very rare kind who gives of herself and who believes in the power of passion, vision, and drive - and achieving your dreams. 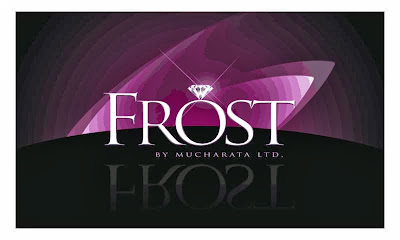 I have written about Frost more than once, and so it was a true delight to be there to see Mucharata reveal the next generation of her jewelry line, and a new website to make ordering her pieces simpler for all of us. I think often about how fortunate we are here, and one of the things that make us so lucky is having entrepreneurs like Mucharata in our community, because not only do they provide a product but they provide inspiration for others to follow their dreams and their hearts in achieving their goals. 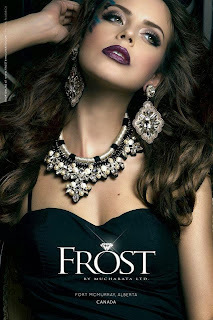 If you are looking for jewelry pieces that are bold and beautiful - and if you wish to support a local businesswoman that we should all find pride in - then you must check out Frost and be ready to be dazzled - because at Frost the beauty is all around you, right from the founder down to the most tender and fragile jewel.